Rumba virus is a ransomware that was discovered on January 19th, 2019. It is a variant of the infamous Djvu virus which belongs to STOP ransomware family and uses the AES encryption algorithm to encode personal documents, pictures, videos, databases and appends .rumba or .ramba file extension. Generally, Rumba virus does not differ from its predecessors (such as .Tfude), as it also drops ransom note _openme.txt and uses the same contact emails – pdfhelp@india.com and pdfhelp@firemail.cc. However, bad actors do state that they want $980 in Bitcoin, also offering a 50% discount within 72 hours of the initial computer compromise. Rumba ransomware has been spotted attacking people in Germany, Hungary, Poland, Turkey, Chile, Thailand, Egypt, and other countries. The main distribution methods used for this version is cracks from a variety of software that is bundled on third-party sites, as well as fake Windows updates. 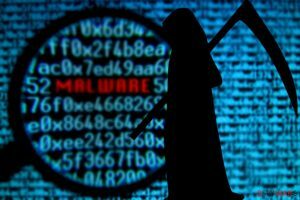 Good news is that malware, alternatively known as Ramba virus, is decryptable. While most ransomware virus authors rely on spam emails to distribute the malicious payload on victims' machines, all the Djvu versions, including Rumba, has been delivered with the help of fake updates and cracked software. Due to the rampant increase in the number of infections, Rumba virus, and all the other variants have become one of the most prevalent crypto viruses in the past months. Users often download cracks such as KMSPico or pirated versions of Photoshop and other legitimate programs, which includes the malicious Rumba ransomware payload. Therefore, it is vital to use protective tools that could block malware infection entirely. Those who did not have anti-malware installed and got infected, should download Reimage or other software that detects the virus, and remove Rumba virus entirely. While most of the researchers advise not to contact cybercriminals, now there are even more reasons to do so, as .ramba ransomware is decryptable with the help of independent security researcher Michael Gillespie. Please contact him if you got infected with this variant. However, make sure that you perform Rumba virus removal before you apply the decryptor or use backups, as all the data will be encoded as well. In case you have no backups and decryption did not work for you, you still have a chance of recovering at least some of the files with the help of professional third-party software. As we already mentioned, security researches are receiving hundreds of submissions from victims in the recent months, so this variant of Djvu is extremely prevalent around the world. 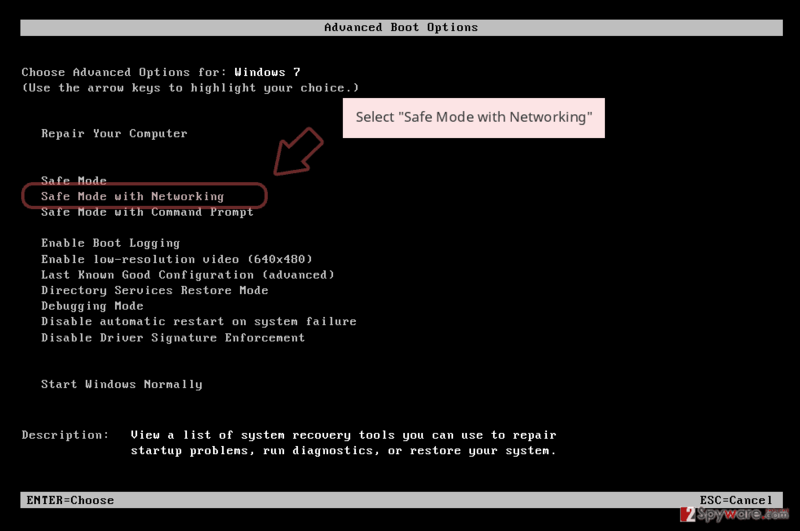 The success is fueled by the effective infection method – cracks and fake updates. 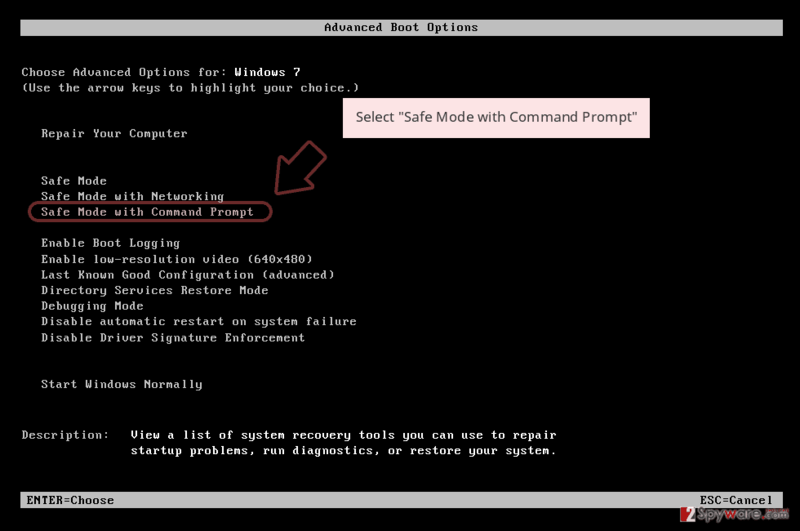 Rumba virus recovery should not be a complicated task, as long as you use reputable security software, such as Reimage. However, some malware might interfere with the normal operation of the computer and anti-malware tools. 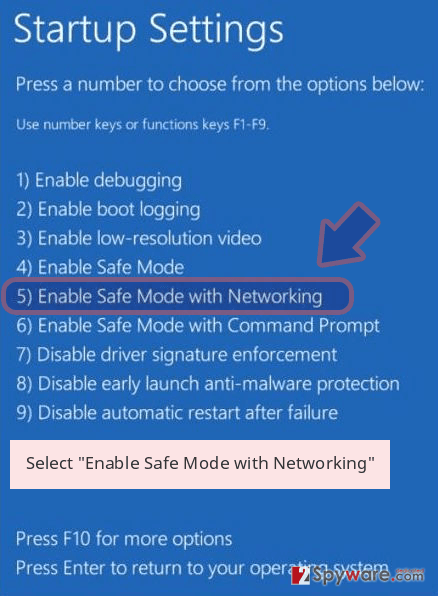 In such as case we recommend you enter Safe Mode with Networking as explained below and perform full Rumba virus removal from there. Once you get remove Rumba ransomware, you can try one of three options to recover your data: use a decryptor created by experts, use backups, or make use of third-party recovery software. We are convinced that one of the methods should work for you, so check the guide below. Log in to your infected account and start the browser. Download Reimage or other legitimate anti-spyware program. Update it before a full system scan and remove malicious files that belong to your ransomware and complete Rumba removal. 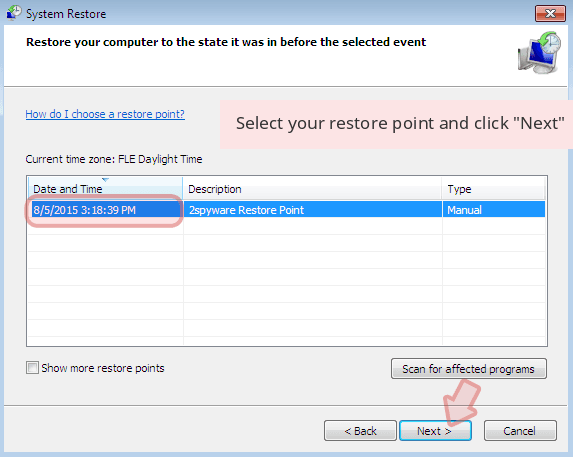 When a new window shows up, click Next and select your restore point that is prior the infiltration of Rumba. After doing that, click Next. 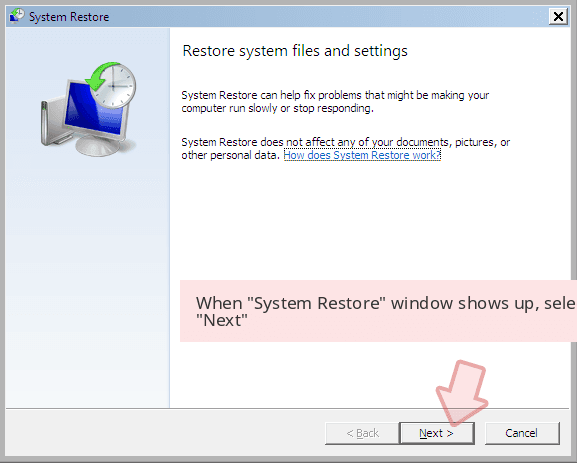 Once you restore your system to a previous date, download and scan your computer with Reimage and make sure that Rumba removal is performed successfully. 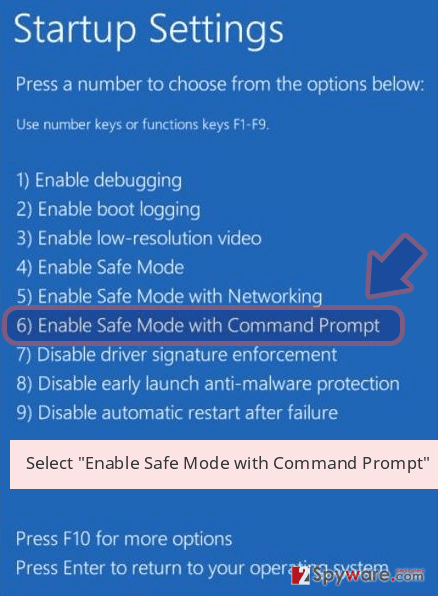 Guide which is presented above is supposed to help you remove Rumba from your computer. To recover your encrypted files, we recommend using a detailed guide prepared by 2-spyware.com security experts. There is no need to pay cybercriminals, as there is an official decryptor created. Pleases find the instructions below. Data Recovery Pro is a professional tool that is known to help some ransomware victims. 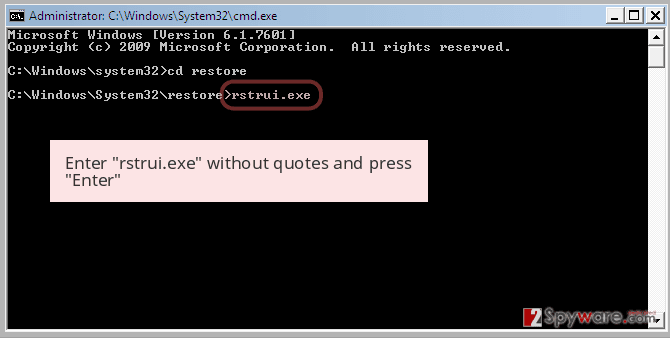 This method is only available if you had System Restore function enabled before the malware struck. If Rumba file virus failed to remove Shadow Volume Copies, ShadowExplorer would be able to recover all of your files. The famous virus researcher Michael Gillespie has recently updated his STOPDecrypter 2.0.0.0 to fight against this Djvu virus version. You can download it by clicking this link. All the instructions and the tool can be found here. ^ How safe is cracked software?. Quora. Question-answer site. ^ Michael Gillespie. If you are infected by STOP Djvu #Ransomware with extension ".rumba" . Twitter. Social network. ^ Pierluigi Paganini. Torrent websites infected 12 million Internet users per month. Security Affairs. Security website. This entry was posted on 2019-01-31 at 08:50 and is filed under Ransomware, Viruses. You can quickly scan the QR code with your mobile device and have Rumba ransomware manual removal instructions right in your pocket. 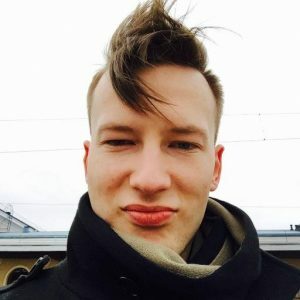 How did you remove Rumba virus?